There are a number of different types of video poker games in existence across the net. Before you play, you should know a little bit about each of the different kinds. Standard video poker is the kind of game that is closely related to the original standing video poker machines. These games offer standard 5 Card Draw poker hands and feature no dealer. The player wins according to what they hold in their hand when it is measured against a pay-table. Wild Video Poker is almost the same as standard video poker games with the subtle difference being the inclusion of a wild card. This wild card can substitute itself for any other card that the player needs to complete a hand. As a result of a heightened chance of success, the lower ranking hands are usually omitted from the game. 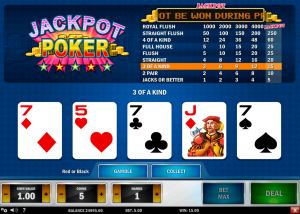 Multi-Hand video poker games exist for both the standard and wild versions of video poker. The main attraction of multi-hand video poker games is that players can wager on multiple hands at once, sometimes with up to 100 hands at any one time. Of course, they must still pay extra for the additional hands. Sometimes, there are video poker games which just don’t fall into any of the genres described above. These are rare, but they do exist. There is no one way of classifying these games. You are best off just trying the free play demos of them to learn how they work but some can be quite fun!